My dear friend Doris, likes to tempt me with her bakings. Not tempting me with the eating of the food, but rather, more to inspire me to bake with her yummy bakings. She mentioned about Nasi Lemak Lover cake and I assumed it was the Marbled Butter Cake. 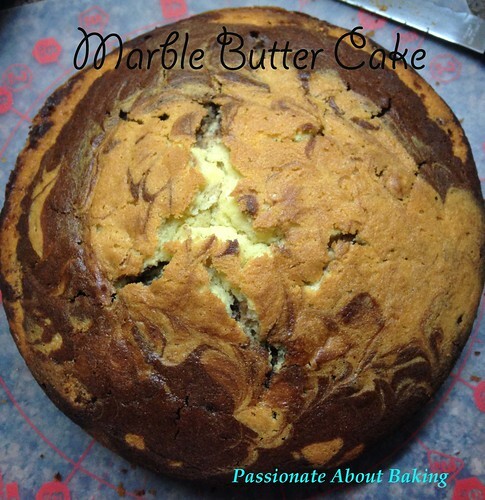 Turned out that she baked the Zebra Cake which was light and buttery, while I baked her Marbled Butter Cake, which was moist and buttery. We both liked the recipe we tried. Heehee.... The butter cake turns out to be really fragrant and moist. Even my children enjoyed it too! 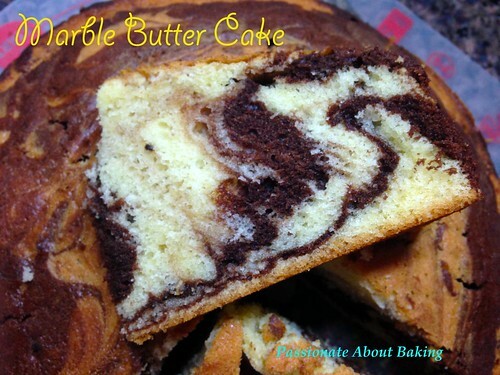 Recipe for Marble Butter Cake, adapted from Nasi Lemak Lover. 1. 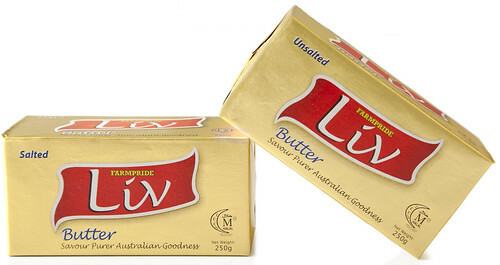 Place the butter, sugar and vanilla in the bowl of an electric mixer and beat until light and creamy. 2. Add one egg at a time, beating well after each addition. After well combine, slightly increase speed and beat for 1min till fluffy. 3. Add the flour and baking powder (sifted together) and beat well to combine, fold whipping cream alternately and combine well. 4. Remove 250g of plain batter and place in another clean mixing bowl, mix well with cocoa mixture. 5. Spoon the two batters, plain and chocolate batter, alternately into the prepared cake pan. Using a skewer, gently swirl it around the mixture in the tin a few times to create a marbled effect. Tap the tin to remove any air bubbles. 6. Bake at preheated oven at 160C for 50-55mins or until a skewer insert and come out clean. 7. Cool it completely before cutting. I'm into baking chiffon cakes recently. 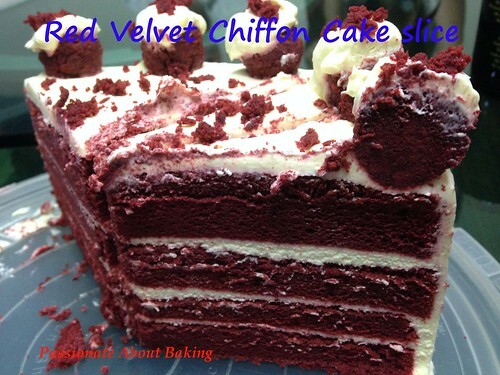 Firstly because I love to eat chiffons, secondly because I want to practice baking chiffon to improve my skills. I bought bananas for my Banana coconut chiffon by adding desiccated coconut to give an extra texture. I made a boo-boo by adding more baking powder and baking soda than required because I saw the wrong measuring spoon. >_<" This caused my chiffon to have really big holes! \oOo/ Fortunately, the taste didn't compromise much. Very fine banana taste. 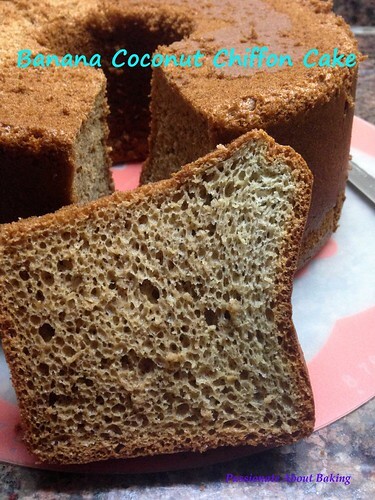 Recipe for Banana Coconut Chiffon Cake. 1. Blend bananas, egg yolks, vegetable oil and 15g sugar till smooth using a handheld blender. 2. Sift cake flour, baking soda and baking powder into mixture. Add salt and desiccated coconut. Mix with whisk till completely incorporated. 3. Separately whisk egg whites till frothy. Add corn flour into the sugar and mix well. Whisk till egg whites are foamy. Gradually add in sugar. Continue to whisk till egg whites reach firm peak stage. 4. Add egg whites to yolk mixture in 3 batches. Mix with whisk till almost even after each batch. Scrape down and fold with spatula till just evenly mixed. 6. Remove cake from oven. Invert and leave it till totally cool. Red Velvet Cake craze has never died off in my family for their birthday request. For the past years, it was those dense sponge cakes which are pretty heavy. This year, my sister's boyfriend happened to be in town and he requested for Red Velvet Cake again. I went online to check if there is a lighter version. 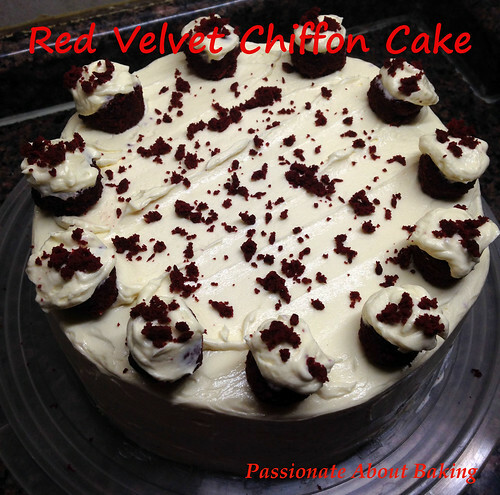 I found a Red Velvet Chiffon Cake recipe and decided to modify it. I used this cake as my sponge cake base. 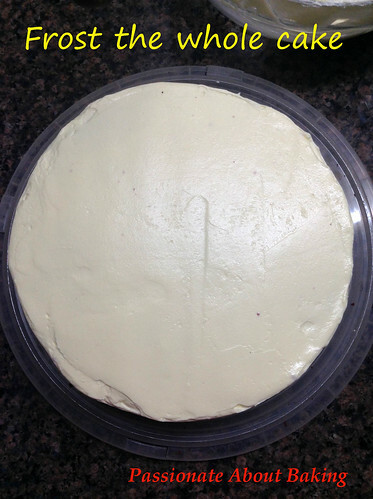 I also modified the usual cream cheese frosting to make it lighter for the chiffon sponge. This cake was very well received by my family members. They liked the light cake texture with the lighter cream cheese frostings. They added that this cake shall be the future RVC for them. 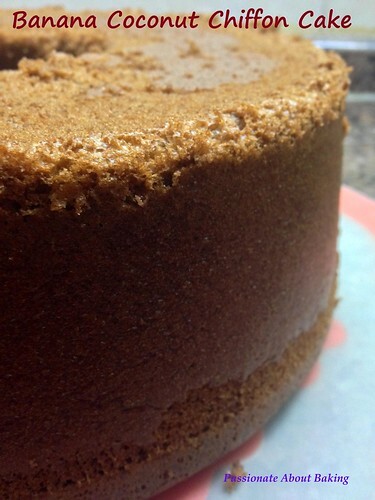 Chiffon Cake, modified from LY's Kitchen Ventures. 1. Preheat oven to 160C. Prepare two 8" round cake pans. Line the bottom but do not grease. 2. 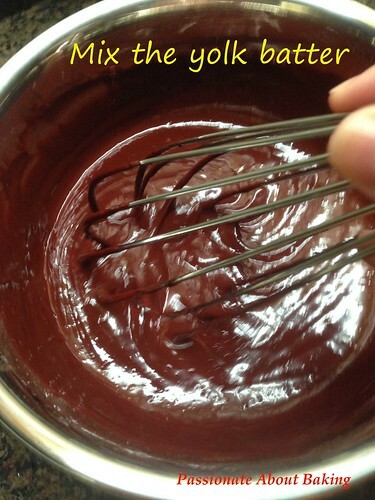 Dissolve the cocoa powder in the hot water. 3. In a small pot over low heat, warm the milk, butter, salt and cocoa mixture to about 60C or until the butter melts completely. 4. Add the vanilla extract and red colouring gel. Stir and ensure everything is mixed thoroughly. Remove from heat.﻿ Set aside. ﻿5. In a large mixing bowl, add the flour and colouring mixture and whisk thoroughly. The batter will become slightly thick. 7. Using a mixer on medium speed, beat the egg whites. Mix corn flour into the sugar well. 8. 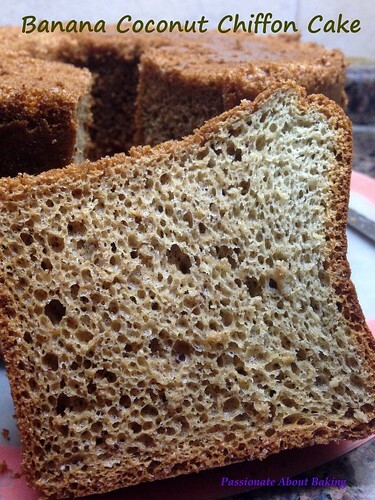 When they turn foamy, add the sugar and flour mixture gradually until soft peaks. 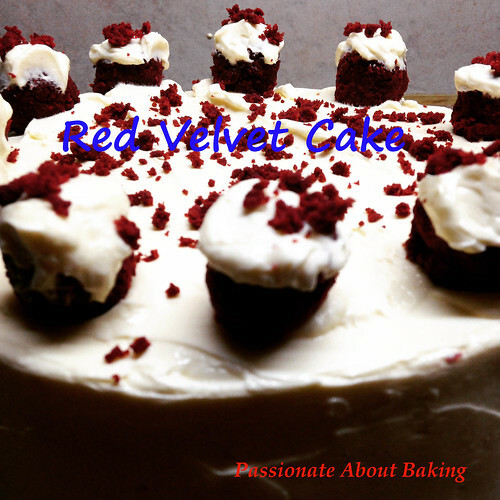 Fold 1/3 of the egg whites into the red velvet batter using a whisk. When the mixture is just combined, pour the batter into the meringue and fold well. 9. Pour half the batter into the two pans respectively. Bang slightly to remove bigger air bubbles. 10. Bake for 10 minutes before reducing the temperature to 150C for another 27 minutes. This prevents the cake from burning. DO not open the oven door while baking or the cake will deflate. 11. Check if the cake is done by piercing a skewer through it. The skewer should come out clean. 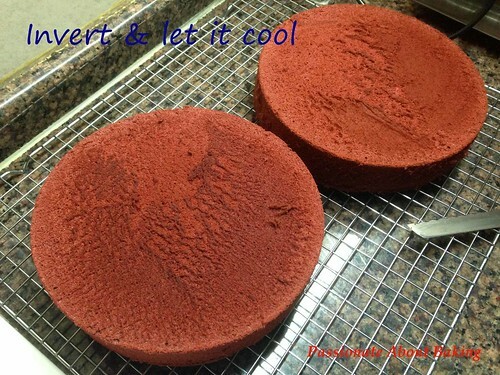 Remove the cake from the oven and invert them. Remove the pans and let them cool completely. 12. Refrigerate to enable easier slicing. 1. In a cold mixing bowl, beat whipping cream till stiff. Transfer to a smaller bowl and keep in the fridge for later use. 2. 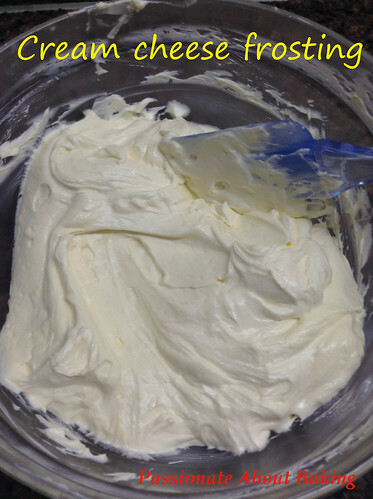 In the same bowl, combine the cream cheese and butter on medium speed, just until blended. 3. Stop and scrape down the sides of the bowl. Add the vanilla and beat until combined. With the speed on low, add the icing sugar in 4 batches, beating until smooth between each addition. 4. Fold in whipped cream. Chilled if not ready to frost yet. 1. 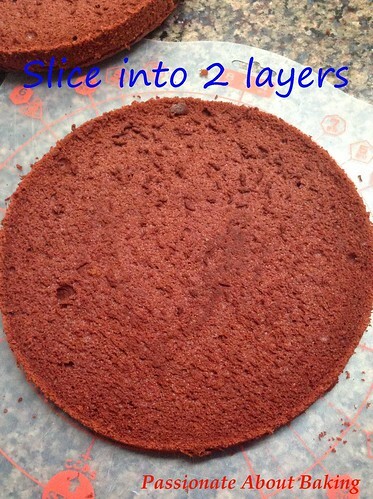 Slice each chilled cake into two equal layers. Slice the dome off for decoration later. 3. Frost the cake completely. 4. With the remaining cake crumbs, add in some frosting, mix well and roll into 12 balls (I rolled 11). 5. Topped the balls with some frosting and placed it around the cake as decoration. 4. Chill the cake to set the frosting. Need not thaw before consuming.